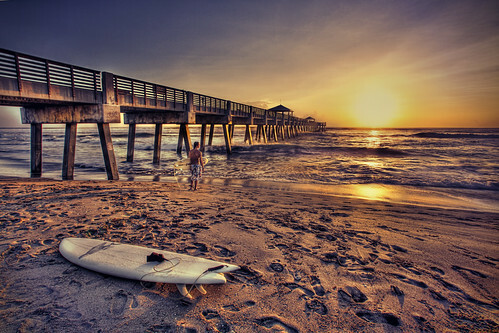 HDR shot of a surfer looking to catch the early morning wave at the Juno Beach Pier. I've lived in Florida 20 plus years and I don't think I've ever seen the waves this big before. The surfers were all out crawling the beach way before the sun broke out. Most of the surfers stood speechless, trying to figure out how the hell they were gonna get out there. I was lucky to get this shot of a surfer with the surfboard laying unguarded in the foreground. Check out Captain Kimo's HDR Photography gallery.